A significant release of archive films online, many of them silent, was announced recently. The East Anglian Film Archive, founded by David Cleveland in 1976, funded by the University of East Anglia, and now located in the Archive Centre, Norfolk, has published online 200 hours from its film collection, the outcome of a major cataloguing and digitisation project undertaken as part of the UK’s Screen Heritage programme which has been doing much to support public sector film archiving in the UK. The search, browse and highlight options can all be accessed via the front page of the site. The site design is unusual, in a plain sort of way, but not ineffective and undoubtedly user friendly. 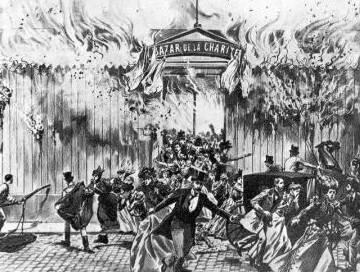 It is certainly easy to find silent era films – you simply go to the browse option, where there is a timeline with sliders which you can drag for dates anywhere between 1895 and 2010, something I’ve not seen on many other sites and which is such a simple, sensible way of guiding people to a time period. Select 1895-1930, and you get around 150 items, all of them instantly playable, and with some some real treasures, surprises and at least one major discovery. The films all come from those English counties covered by the East Anglian region, including Bedfordshire, Cambridgeshire, Essex, Hertfordshire, Norfolk and Suffolk. So there are many films of primarily regional interest only (which is of courses the raison d’être of a regional film archive), though equally they are encouragement to anyone interested in film history and history through film to consider the importance of place and regional (not just national) identity in film culture. For example, John Grierson’s celebrated documentary Drifters (1929) is generally lionised for its early position in the history of the art of documentary film, but it turns up here (in its entirety) because it was partly shot in Great Yarmouth, Norfolk. Drifters is, fundamentally, and importantly, a regional film. There are many other records of the East Anglian region, from interest, travel, amateur and newsreel films of the period. The latter include probably unique examples of the rare Warwick Bioscope Chronicle and British Screen News newsreels, and local newsreel the Bostock Gazette (a number of UK towns and cities in the silent era had local news services, often maintained by an indiviual cinema where the projectionist doubled as camera operator, though other such ‘newsreels’ were produced by local enthusiasts on an amateur basis). 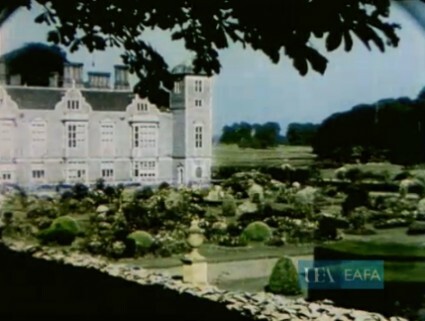 There is 1929 stencil colour film of Blicking Hall in Norfolk, from Pathé’s cinemagazine Eve and Everybody’s Film Review; film pioneer Birt Acres’ 1896 film of Yarmouth fishing trawlers, the first film made in the region; an experimental work by George Sewell, one of the founder members of the Institute of Amateur Cinematographers, whose The Gaiety of Nations (1929) is a visually inventive comment on world politics; and several delightful examples of silent advertising films, including a number advertising Colman’s Mustard, which were based in Norwich (see for example the spoof 1926 newsreel The Mustard Club Topical Budget, featuring a popular set of characters from an advertising campaign of the period). 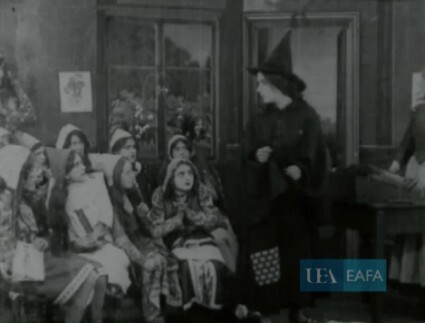 The major discovery is The Herncrake Witch (1913), which I had believed to be a lost film. It is a drama starring Jackeydawra Melford, one of the first women to direct a film in Britain. We have written about Jackeydawra Melford before now, in one of the earliest Bioscope posts, noting that she produced and starred in The Herncrake Witch (1912), The Land of Nursery Rhymes (1912) and The Inn on the Heath (1914), directing the last of those (her actor father directed The Herncrake Witch). None was known to survive. The EAFA catalogue record doesn’t give that much information about the film, which is intriguing in theme if quaintly produced, noting that it was made by Heron Films, a company founded by Andrew Heron who worked with Arthur Melbourne-Cooper, of whom more in a moment. The film is described as an ‘excerpt’, though there can’t be too much missing (it runs for 8 minutes, and the original length was 710 feet). Anyway, it is a major discovery for those interested in British silent women filmmakers, of whom there are a number. Another welcome surprise is from another woman filmmaker. 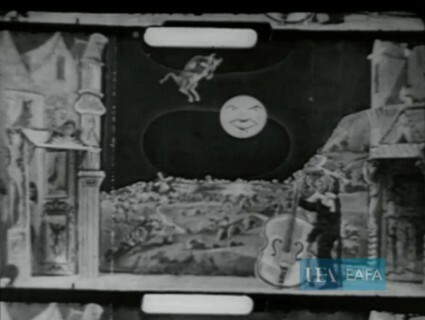 Hey Diddle Diddle, the Cat and the Fiddle (c.1901) is an example of the 17.5mm Biokam films issued by Brighton filmmaker George Albert Smith, for which there reasons to believe that the director was his actress wife Laura Bayley. What its East Anglian connection might be I’m not sure, but it’s a precious example of a pantomime act filmed on stage (the practice seems to have been that Smith made a 35mm film of a subject, then his wife shot the 17.5mm version, possibly simultaneously, but sometimes at a different time, as there are noticeable differences between the few examples where both 35mm and 17.5mm subjects survive). A third example of a woman filmmaker is the amateur comedy Sally Sallies Forth (1928), directed by Frances Lascot, working with producer/editor Ivy Low, which is a well-produced example of the considerable number of amateur film dramas made at this time by hobbyist individuals and film clubs. It would have been nice to have a bit more information about the film’s production on the catalogue (not least where it was shot). From pleasant surprises to not so pleasant surprises. There are several films in the collection attributed to the aforementioned Hertfordshire filmmaker Arthur Melbourne-Cooper, indeed there is a special section of the site devoted to him. Cooper is an interesting figure, involved in British films as assistant to Birt Acres from the earliest years, and later an important pioneer of the animation film. Unfortunately, his daughter and later some film historians took up his cause as a neglected master of early film, and claimed for him a number of films that he never made, or misdated other films to make them seem earlier examples of film innovation than is in fact the case. In some cases it seems Cooper told his family that films in his collection were ‘his’, when they were only so insofar as he may have exhibited them once and now owned them. I won’t go down the tedious route of pointing out which titles are wrongly identified and which aren’t (and there a quite a number that are genuinely his). It’s just really surprising that a responsible archive such as the EAFA put up these films with their dubious attributions to the fore, especially when their catalogue notes usually give pointers to the correct identification. This abberation aside, the East Anglian Film Archive‘s new website is a very welcome new resource. It not only documents the East Anglian region so well, but for the silent film specialist it present the great variety of films of filmmaking from our period: dramas (professional and amateur), newsreels, travelogues, trick films, advertising films, industrials, magazines. It celebrates the medium in all its inventive richness, while reminding us of the particular meanings films have for particular people. If you ae interested to find out more about the UK regional archives, visit the Film Archives UK website, or else read the 2009 Bioscope post on some of the UK regional film collections to be found online, including the Yorkshire Film Archive, Screen Archive South East and the Media Archive for Central England, all of whom have signficant silent films collection available to view online. And if you want to find them all (or at least a lot of what they hold) in one place, they you must try the new Search Your Film Archives portal hosted by the BFI (another UK Screen Heritage output). There is so much out there now to be found – do please reward the archives and those who have funded these initiatives by browsing, viewing, and taking film journeys down routes that you may not have expected.